Sarah Unknown married James Pack (Private, 37th Regiment of Foot) in 1820. She is listed in the 1851 census as 50 yrs of age and born in Ireland. visit (research) about once a year! disbandments on Al's site which was so generously donated by Alexa Pritchard i.e. I am assuming Goulbourn twp. which is located in the Stittsville, Ontario area. Thanks for your e-mails regarding James Pack, an early settler in Goulbourn Township. village of Stittsville now. There is a Jonathan Pack Street in Stittsville today. This may have been part of the original Pack farm. Do you mind if I add your e-mail, including the map of Stittsville, to our web site? We may hear from other researchers who may have a record of Sarah's maiden name. Pritchard is a name that sounds familiar; she may have supplied it to my family. Richmond Ont. Married Elizabeth (Eliza) Spearman 2 Jul 1850 at St. John’s Richmond Ont. Joseph Peck b. Jan 1865 (in Ont) bap. 11 Nov 1905 (in Danford, Pontiac County, Que.). Married Mary Matilda Taylor 25 Mar 1894 at St. Peters, Cawood Quebec. to include my name and email to your website as you see fit. This map of Stittsville in 1879 shows the Pack farm (upper left corner). Station. At one time (maybe in 1879, this was a Temperance Hotel). The initials "J.S." on the corner of the Pack farm may be Jackson Stitt, the founder of Stittsville. of the Pack farm may be Jackson Stitt, the founder of Stittsville." many many more that I can't think of now. A grandson of William Shea moved up there in 1900. Danford village before she died last year. Or is that the aunt you were referring to? this day with the older folks. Danford used in the last 70 yrs. Coincidence? Maybe not. Where were Sarah and James married in 1820? I have been looking for the parents of my gg grandmother Mary Peck / Pack for several years and came upon your site just now. Manitoba. Frances died in 1889 along with their 3rd child, Francis Elizabeth. between 1829 and 1829. According to the Clearsprings information, she was Mary Pack and was born in 1829.
them but with no results. I also have Eliza, Francis Fanny, Issac, Jane, Margaret and Ann Pack/Peck tied in with Mary. There was a medical doctor Dr. James Peck with the 41st Regiment when they landed in Quebec city in 1798 I believe it was. I referred to his reports in my book Family Friends and Neighbours of Sgt William Shea. (noted above). gold mine of Packs there in Danford also one branch in Aylwin twp. I don't know if they are related but I expect so. I just came across the Bytown or Bust website and saw your enquiries re James, Sarah and Mary Pack. I also have a connection to the Pack Family. James Pack is my great-great-great grandfather. Elizabeth b. 1839, Jane b. 1840, Sarah b. 1843, Fanny b. 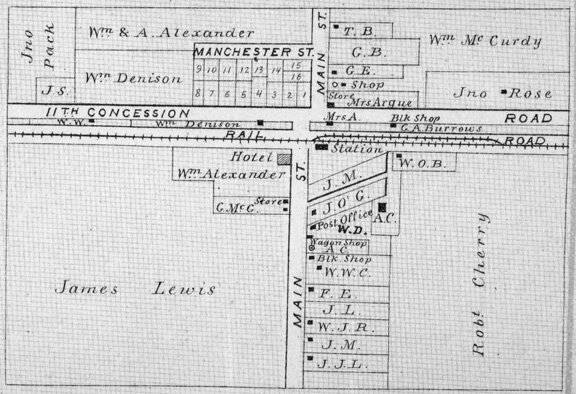 1846 and James b. 1850. Sarah Bradley b. 1801 in Ireland d. 7 Nov. 1884 Carleton County. Bresneham over a boundary dispute according to the write-ups in the Ottawa Citizen. owned Lot 9 Con 1. Their names appear on the 1879 Atlas for Torbolton  Township. I have no further info regarding the other members of the family.